Does Witherscale Wurm get tokens from Amonkhet cards? 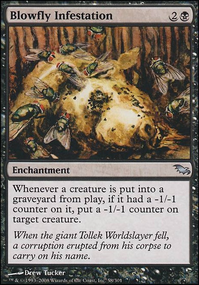 How do -1/-1 counters interact with Walking Ballista and Hapatra? Forcefight and Assault Formation; how does it work? 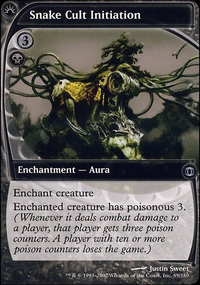 Whenever Hapatra, Vizier of Poisons deals combat damage to a player, you may put a -1/-1 counter on target creature. 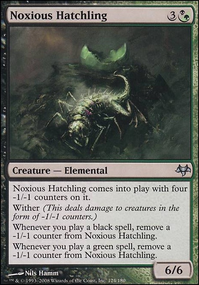 Whenever you put one or more -1/-1 counters on a creature, create a 1/1 green Snake creature token with deathtouch. 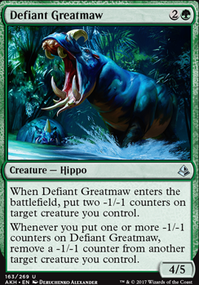 Hello, this is a new commander deck I'm working on. For now, I'm trying to make it work with Skullbriar, the Walking Grave and a +1/+1 counters synergy, I'm looking for any suggestions and tips you can give me in order to improve it! I've also considered on using Hapatra, Vizier of Poisons or Jarad, Golgari Lich Lord as commanders, but I don't know if they would work without changing most of the deck, bearing in mind that I'm on a tight budget atm. The deck is intended for kitchen table MTG and maybe an occasional visit to my LGS, so I wouldn't be looking for US$10+ singles yet, anything below that is very welcome. Evolution Sage, perhaps? 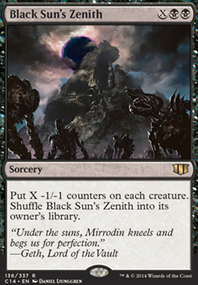 (War of the Spark, no English spoiler) - proliferating with each land drop could make a lot of tokens. Time of Need would help you get Hapatra, Vizier of Poisons . Nightangel51: For starters Puppeteer Clique is a black creature, so Ivy Lane Denizen does not trigger off of it. However, to better answer your question within the right context established, we're going to use Kitchen Finks instead. 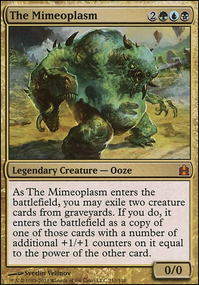 Hapatra, Vizier of Poisons states whenever a -1/-1 counter is placed on a creature, but Persist states that the creature enters the battlefield with the counter, so it fails to trigger Hapatra. It does however trigger Ivy Lane Denizen . For your first deck it is better to stay away from having too many colors. It just makes the deck more expensive and harder to put together, imo. That said if you want other colors then go for it. 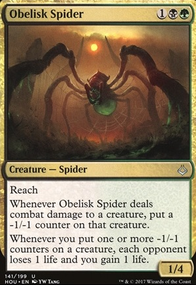 Since you want the deathtouch/trample thing I would go for one that already has deathtouch or trample. So here are a few you might really like. Glissa, the Traitor - generally an awesome stax deck with her being able to kill most anything. Lots of equipment give trample and if they get blown up she can put them beck into your hand. 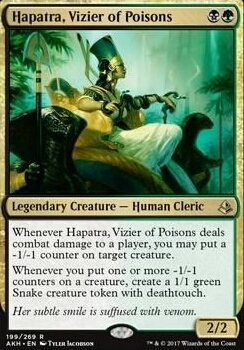 Hapatra, Vizier of Poisons - doesn't have either ability her self but makes tons of deathtouch tokens. 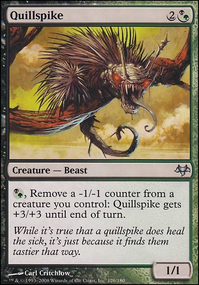 It is a fairly easy step from there to give them trample and pump them with any number of green spells. She is also a pretty staxy commander. Gorm the Great // Virtus the Veiled - I haven't played this pair but I've seen them in a few games. Virtus is devastating... And no one wants to get hit with him so he almost needs to be given trample or other evasion even with Gorm being present. Sisters of Stone Death - She is a bit different. Technically she doesn't have deathtouch. What she does is better! Add trample and she does her thing while smacking in for a lot of commander damage. Finale note is power level of these commanders. None of them are considered competitive and Hapatra and Glissa are likely the only ones I listed that could sit comfortably at a high powered table consistently. And your strategy doesn't always work very well in commander. The attack step is usually just not strong enough... Still you should play what you want. I've been having a hard time figuring out a new deck to build, so I decided to mash together a few ideas. I think there's something here, but it needs quite a bit of changes. 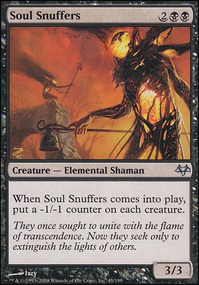 I started with a Mardu Aristocrats deck, but didn't quite like that. In parallel, I tried -1/-1 counters and didn't quite like that. So, I'm trying to use the tokens made from the -1/-1 engines ( Hapatra, Vizier of Poisons , Flourishing Defenses , and a few others) to fuel my aristocrats. It's pretty lackluster right now, so what do you think? Is this just a pile of cards or could it be a deck? For some background, my group is pretty casual. Nothing infinite, and for now I want to stick with cards <$5 until I figure out if this will work. Hapatra, Teysa Karlov , and The Scorpion God were among the cards I wanted to play most, which is what led to me 4 colors. 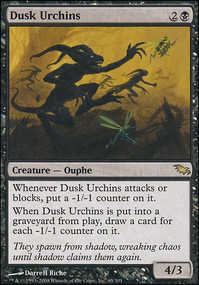 Darkshadow327: Favorite to play is probably Hapatra, Vizier of Poisons . The deck I am most proud of is The Locust God . I think Hapatra, Vizier of Poisons could be viable, but she'll require a bit more build-around, since she's based on getting combat damage through. But she could be done. Nath of the Gilt-Leaf could be good, as well, building around the discard theme along with Aristocrats. As far as lists go, I've got a Slimefoot, the Stowaway deck in the works right now, but its a ways from being finished. I did recently finish a Prossh, Skyraider of Kher build that runs a lot of Aristocrats. If I was going to build it, I'd probably go with Savra, Queen of the Golgari , or Mazirek, Kraul Death Priest , but that's just me. 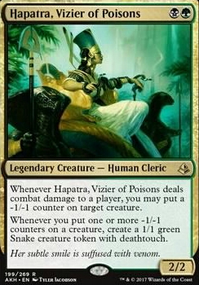 Also how do you feel about Hapatra, Vizier of Poisons ?